Bring your Cardinals, Blues, Mizzou, SLU and St. Louis sports questions, and talk to Post-Dispatch columnist Ben Frederickson in a live chat starting at 11 a.m. Tuesday. I would much rather see a Mizzou-Illini football game at Busch Stadium every season. That would be sweet. And I think it will happen eventually. Imagine that, in the snow. Sign me up. Biggest fear for the Cardinals and other teams is waiting on Harper to make a decision and the losers of that decision may be left with slim choices left on the free agent market. Correct. There's a reason the Cardinals want to know what's up with Goldschmidt before winter meetings begin. 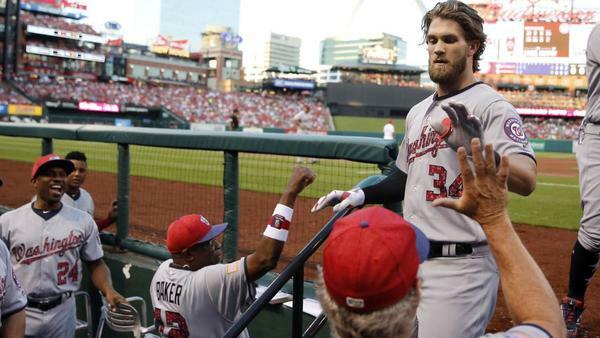 The Harper sweepstakes is expected to be a long, drawn-out one. That's the way Boras rolls. You could imagine Harper turning the final day of winter meetings into his big press conference day in his hometown, but if there is money to be made by waiting, he and Boras will almost certainly wait. Will the Cardinals hold off on pulling the trigger on Goldschmidt because they wanna see what happens with Harper? Or vice versa? The big problem with watching a Mizzou - Illinois football game every year? It means watching an Illinois football game. That program is awful. Where do you stand on the idea of the Cardinals trading for Goldy AND signing Harper? It seems like adding Goldy wouldn't hurt your pitch to Harper, and this would both lock in the long term and boost the current window. Do you think its idea, and do you think there is any universe where the Cardinals would have that kind of killer instinct for winning? That would be a dream scenario. I have a hard time imagining the Cardinals being willing to part with the cash and prospects it would take to land both. It's not a huge issue, because only the top-shelf potential draft picks do more good than harm by doing it. If you play for a team in the College Football Playoff, you are playing, because you want to win a championship. If not, NFL teams wonder about why you play at all, right? If you play for a team in a "normal" bowl game, you probably have to be a lock for the first round in order to help yourself by not playing. For most NFL hopefuls, the bowl games are a chance to put another game on film with a lot of eyes on it, against good opponents. Lock is one of the guys who you can make a case for sitting out. Just don't try to convince him of that. He didn't even think about not playing. Ben you mentioned getting an Alabama recruiter to help the Cardinals, I know that Nick Saban will land at the 50 yd line at a high school football field dressed in Crimson Tide sweats to entice a high school star athlete...maybe Mo can land a helicopter on Harper's roof dressed in a Fredbird costume...think that could seal the deal? Are fans authentically worried about resigning Ozuna? It seems to me that Tyler O'Neill should be ready to slot into that spot pretty easily. I think most fans want to see Ozuna be the hitter they thought the Cardinals were getting before they campaign hard to extend him. That said, I'm in the skeptical camp when it comes to O'Neill. The Cardinals just signed a hitting coach based off of the importance he puts in contact rate and decreasing strikeouts. O'Neill struck out 40 percent of the time last season. He's got big power, but he will need to make better contact if he's going to be a starter here, I think. It's deja vu all over again!! Last year, Cards fans were all hyped up about Stanton. This year it's Harper and Goldy. Harper ain't coming here and Sirius XM just reported Houston and Arizona are working on a trade for Goldy. Houston is also in on Goldschmidt. Interesting competition there for the Cardinals, considering the history. If Bryce opts for a bigger market or someone blows everyone else out of the water and things don't come together for a Goldschmidt trade, any chance the Cards go for a front line starter and a big arm in the bullpen and we try to win every game 2-1? The bullpen is going to need help no matter what moves are made for the lineup. It's not middle-of-the-order-bat OR bullpen help. It's both. The Cardinals have not expressed much interest in top-of-line starter additions. They have a bunch of depth, and seem willing to see what sticks come spring training. Maybe that changes if they strike out on Harper and Goldschmidt now that Donaldson is gone. In my opinion, it's alarming to state middle-of-the-order bat as your big need, then not add one or one that could become one. Saying you need a heart of the order hitter and then adding just pitching would be alarming to me. Anyone called Jon Hamm to help with the Harper recruitment or is he too old for the Harper age group? Maybe Jenna Fischer from "The Office?" I'll bet Harper watched that show a time or two and has fond memories of Pam. I'm way ahead of you, good sir. Appreciate these chats every week...Cards fan, Oklahoma State alumni. We may not have any eligible players left for the bowl game against Mizzou with our dudes leaving the team in middle of year and now declaring for NFL. Any chance we can just turn it into a pickup game? Gundy also has a strong mullet, but he is ant-media, so he loses points there. His cute little threaten-the-media thing he tried earlier this season kinda blew up in his face. I'll point out that Mizzou got completely embarrassed by a Texas team that saw multiple starters sit out from the bowl to guard against injury before entering the NFL draft. The Tigers are on a mission to erase that Texas Bowl from our minds. I'm not an aficionado of the rap genre, but isn't Nelly a one hit wonder? And if so, didn't that one hit come out when Bryce Harper was in grade school? I'm sure Harper is dazzled by the recruitment. One-hit wonder? No way. Country Grammar is littered with legendary songs. And more came after. Now, these days, not so much. Touring with Florida Georgia Line, the Backstreet Boys of country, is not the greatest thing in the world. You could get the pope, Ariana Grande, and the ghost of Stan Musial all make calls to Bryce Harper on the Cardinals' behalf, but we all know those recruitments would be meaningless. He's going to the team that offers the most money. End of story, and end of the Cardinals' chances. At some point is Mo the problem? Not with just building the roster but being the team's ambassador? Maybe the FAs aren't connecting with him. Mozeliak has mentioned recently that his boss, that would be DeWitt, gets frustrated when the Cardinals come in second in these scenarios. But it's not just Mo that meets and greets and sells. Harper, for example, will be sold to owners. That's how Boras rolls with his best. So, with this thinking, the ball would be in DeWitt's court when it came to surprising the baseball world and landing Harper. In addition to the impact bat being sought, what do you think about swapping Fowler to Seattle for Seager. Seattle benefits from additional salary relief. Cards get a needed LH bat to balance the lineup, one with potential upside. Fowler would assuredly be guaranteed a nice lineup spot on a non-contending team. It truly seems a win for everybody. What are your thoughts on such a deal? This is not the answer you want, but I don't know why any team would want to trade for Fowler at this point in time, pointing to the reasons I listed earlier in the chat. Nothing has changed in my mind since the end of the season. There have been no games played that have changed my thinking. Spring training offers a chance to prove his health, his impact, his potential moving forward. Hard to find good reason to change mind until then. Touche regarding Gundy. I assure you the OSU fan base is about as happy with Gundy's antics in the last year as the Cardinals fans (including myself) appear to be with the trade deadline this last year? I'm glad to hear you and some of your fellow Okies saw through that stunt he pulled. Does it make sense to offer Bader in a package for Goldy,then sign Pollock? If the Cardinals were willing to trade Bader, would they a) publicly announce him as their starting center fielder next season, b) bring him to St. Louis to debut the new uniforms, c) send him to MLB Network to promote the team and the brand, d) send him to the Blues game to drop a first puck and e) celebrate him to anyone who will listen as proof they can produce a home-grown needle-moving talent? No mention of Bradley Beal in your story? I'm betting him and Harper have met a few times in D.C. Maybe he can slip something in Harper's ear. I was running out of room. I should have had him in there with JT. Good point,I live in Arizona,wasn't aware of his community involvement......My bad! He's been pushed forward as a face. Faces -- young, const controlled ones -- don't usually get traded.